As I've been working on putting together texts for the Frolyc Activity Spot app, I've been watching lots and lots of online videos--the good, the bad, and the ugly. These kinds of videos have amazing potential as classroom resources. As I watched, I thought back to how I started out with adding video to the classroom and what I am thinking now. I must admit that when I first started looking for videos for my classroom (back in 2011, when I first had access to wireless), I was drawn to highly produced video clips. I wanted to be very careful about what I wanted to show in the classroom and I gravitated toward video clips created by familiar companies. But as I've combed through more videos, I've come to value the smaller scale productions by museums, labs, and other groups. While these videos don't always have the fancy music or clever titles, they do feature experts in the field. They also can spark great discussions with students about credibility--how do we know that these people are good sources? I can't wait to share some of the videos from Jefferson Labs with my students. This year I experimented more with showing raw footage to students. We all loved the Cornell Nest Cams during the spring. Students also enjoyed seeing time lapse footage during our Earth cycles unit--watching the day/night cycle and the cycle of the seasons in time lapse is lots of fun. To help students understand the way that ferry boats work, I showed a time lapse of a Vancouver ferry. What does a time lapse video show? How is it different from a video shown in normal time? Why might someone create a video in time lapse? These are all great questions to consider with students, and these questions are why I value YouTube more and more. (With safety mode always enabled and videos always previewed, of course!) With teaching about firsthand accounts becoming more and more important, it's important to share and talk about firsthand accounts with students. Whew! I finally redid the entire Character Traits and Emotions unit. This was one of my last units that was still a single Word document. The revised unit has individual files, a character traits PowerPoint, stories, activities, and lesson plans. I'm still getting lots of requests for spelling lists. Our homemade lists and activities are in a folder on Google Drive. Send me an email from your Google account (elkissn@gmail.com) and I'll add you to the permissions list. And please do let me know if you use the program! We could have our students share activities or something. I have found the Lexiles for most of the texts in my Text Structure units, but I haven't yet updated the units to reflect this yet. Let me know if you are interested in this information before the school year begins. In some circles, PowerPoints are rather--well, old-fashioned. With ever-expanding technology choices, who uses slideshows anymore? I felt a twinge of embarrassment as people at a recent meeting exchanged glances when I admitted to making vocabulary PowerPoint presentations. I think that people have the perception that teachers make PowerPoints and then just read them aloud to students. But then I decided that there is nothing at all embarrassing about it! PowerPoint is the perfect tool to use to help kids learn new vocabulary words. With just a few simple slides I can project definitions, examples, and engage kids in using these words. It is not a lecture at all as kids are actively engaged on every slide. Even better, we can go back to the presentation again and again to review the words and think about them in new ways. Here is how I go about making presentations to go along with texts. If you are getting started with this, try making just a few your first year, going along with high-quality texts that you know you will be reading and rereading several times. Each year you can add a few more. Hm, this is easier said than done, isn't it? I like to use words from the Academic Word List, and I choose about 3-5 per text. You can also write to me and I'll send you an Excel spreadsheet that has the AWL words, Common Core words, and other important words, all filtered according to important characteristics, roots, and so forth. This list is a little easier to use because the words are in alphabetical order. I make about 4-5 slides per word. On the first slide, I introduce the word with a kid-friendly definition. I make this definition based on dictionary results and how the word is used in the text. In the case of characteristic, I used the words "feature" and "trait", words that students have already learned. I add a pretty visual to go along with the definition--sometimes a picture that goes along with the word, sometimes a picture that goes along with a future activity. I have a huge library of photos that I've taken on my rambles around Pennsylvania, and kids are always interested in hearing about my photos. When I can't find the photo I want from my own library, I visit Wikimedia Commons. I have learned so much about integrating visual and verbal strategies from the work of Gary Woolley. For these slideshows, I like to give kids an instant connection between photo and word. This is especially important for academic words, as they often have abstract meanings. If I can give kids something concrete to think about as they apply the word meaning, I can help them to remember the word for the future. Teacher: What are some characteristics of the butterfly? Teacher: That's right! An eyespot is a characteristic of the butterfly. Teacher: Can you put that into a sentence using the word characteristics? Student 1: Eyespots are characteristics of the butterfly. Student 2: Some characteristics of the butterfly are wings and antennas. Often this will take prompting and framing. However, it's so worth the effort to get kids using the words! Having kids put their responses on whiteboards is also helpful. I try to have as many kids say the word as possible, whether it is by sharing with a partner or getting up and doing a word "meet and greet". This works better with some words than others. The point here is to help students use the word in a way that applies to their own lives or experiences. Many students will need help with framing sentences for their responses--"My physical characteristics include..."
A new photo isn't necessary here, but my kids love fun visuals and I like to give them lots to look at. The key is to keep the pace quick and upbeat so that this will be something that you come back to. The text that goes along with this presentation is about the red-tailed hawk. Notice that the word predator is also in the slide. This word has a much more concrete meaning, and some kids in the class already know it. Instead of giving up valuable real estate to this word, I integrated it into this slide. Connecting the word characteristic with predator helps students to get ready for how both words are used in the text. When we return to this presentation after reading the text, I encourage students to use their "soft eyes" to scan for the word characteristic in the text. We read the sentence aloud together. Then we talk about how their early sentences compare to their new knowledge. And that's it! I like to do this with about 5 words per text. We use the presentation before and after reading. It is so gratifying to hear how their examples and sentences quickly improve in quality the second time around. Like all instructional techniques, PowerPoint does have the potential for misuse--if I just read aloud the definitions, kids would quickly be bored. But a slide presentation with lots of conversation and interaction can be a powerful way to help kids connect visual and verbal information. This year, I'm going to add a vocabulary notebook for students to use to keep track of words that they are learning and reading about. I'm not sure what I want this to look like--are there any formats that have worked well for you? This presentation is included in Reading Intervention for Academic Vocabulary and Fluency. In my early reading years I did not have a good attitude toward the word prose, mostly because Anne of Green Gables described boring days as "prosey". I wasn't really sure of what prose was back then, but if Anne didn't like it, then I didn't like it either. As an older reader I realized that prose is not necessarily dull (although the word "prosey" can be found in a number of old books from the 1800s). It's good that I have come to like prose, as it is included in the fourth grade Common Core standards. 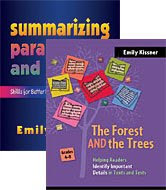 Students will need to be able to explain "major differences between poems, drama, and prose." As you can see, structure is the key to differentiating among these kinds of text. Fiction and nonfiction can apply to any of these texts. Wow, this will be a tough thing to teach at the beginning of the year. (Or rather--it will be easy to show students the chart and explain it; what will be difficult will be making sure that students can easily access and apply the information.) I'm planning to adapt some of the activities that I already use, like sorting mini-texts, and I've created some new things to help students look more carefully at comparing texts.